A look at what I wore on the second day of NYFW! To see a behind the scenes look at our adventures in the big apple you can follow on my snapchat: rachparcell and my Instagram. Happy Monday! LOVE your pants, Rachel!! I am trying to find a good pair of flair jeans right now and these look perfect. 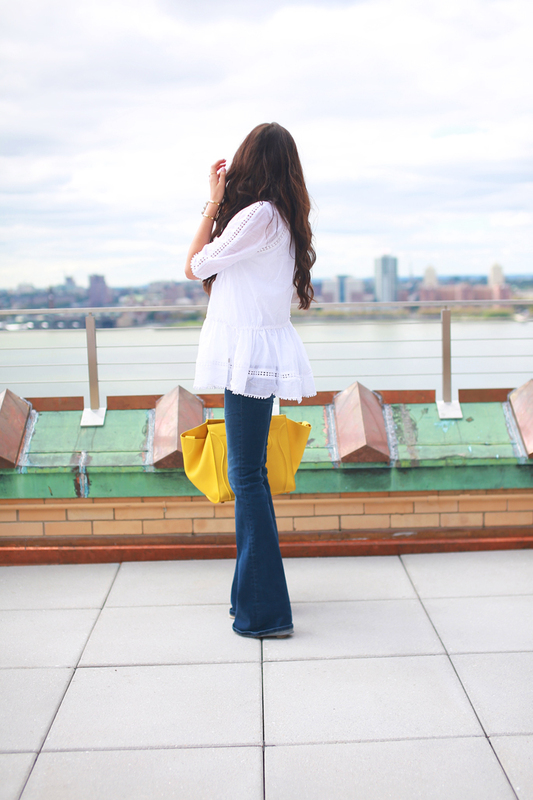 Love the flares and bright pop of yellow from the Celine bag! Hope you’re having a great time at NYFW!! I like this top very much! You look very pretty! that top is stunning and that bag is to die for! Looking beautiful in this outfit! Your flared jeans are pure perfection! This looks amazing on you and you look so happy!! Love the top, the flares, the bag. Perfection. Beautiful top!!! Looks like it would be great for a maternity top or post partum as well! Thanks for sharing! This top is so pretty! I love how detailed it is, while still having a subtle appearance! You look beautiful Rachel! Love the pop of color with the bag! Perfect as always Rachel! That top is so gorgeous and I love it paired with those pants! Love that bag and the color! Love this outfit and that bag is so nice! LOVE this look! That pop of yellow is perfect! Love the flair! Such a great pair of jeans, girly! Love your flare jeans! I want a pair! Love the bright yellow color. Those flares are AWESOME! And that yellow Celine is to die for. Love this!! That silhouette is great on you and I love the yellow! It is the perfect mix of summer and fall! I love the top!! I watched some of your snaps and have seen your IG photos… looks like you are having a great time! Love the top, and the pop of yellow. The Zimmerman show was one of my favs! I love that top! So pretty and feminine! I’m sorry, but those jeans need to be re-hemmed, or worn with the right shoes. Turning flares up like that just looks ridiculous. It’s ok to have an opinion. Please just state it more gracefully. Telling her she looks ridiculous is out of line. She doesn’t look ridiculous, the pants do. I am looooving this look! 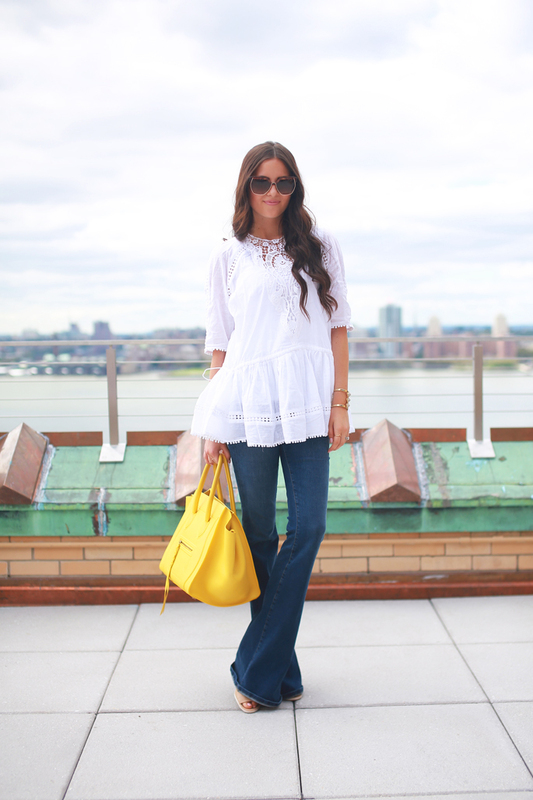 The flares and the white tunic.. just perfect! These flared jeans are gorgeous! Loving the top you paired with them too. Gorgeous photos and love those jeans! Such a flattering cut on you! Love the flared denim, great style! The detail on that top is gorgeous! And that yellow Celine…amazing! Super cute look! 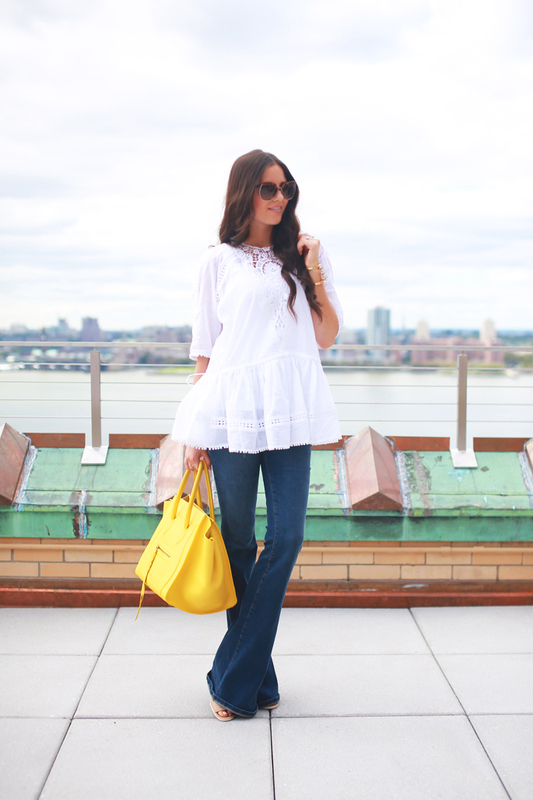 I love this top paired with the flare jeans, such a cute combo! So gorgeous! Love the casual look for NYFW. SO IN LOVE WITH THIS LOOK! That top is amazing and I love those sunnies so much. You look so pretty! I love when bloggers do fashion week a bit more casual, and don’t get too dressed up…seems so forced. This is such a great look on you!! Agreed- I wish I had the figure for flare jeans haha! Gorgeous, Rach!! Love the pop of yellow! That top is so whimsical and beautiful! I probably would’ve never picked these sunglasses for myself but they look so chic on you! Love the bag and brightness of it!!! It is fabulous, for sure! I wishhhhhhhh so bad I owned some Zimmerman dresses. Dying over every single dress from their brand! Love this bag!!!!! Those Frame denim jeans look great on you. I am more of an hourglass figure Any tips for wearing flares? Loving this look, Rach! That bag is gorgeous and I’m also loving those sunnies! LOVE the flowy white top, so cute for fall. I’m loving the flare jeans on you! So pretty with that top! I love how you always have a pop of color through your accessories! Your top is gorgeous; I love the details and lace of it! love your handbag! and you look like you have a great tan! I have never seen you look so tan. Beautiful look :) Love the bag! 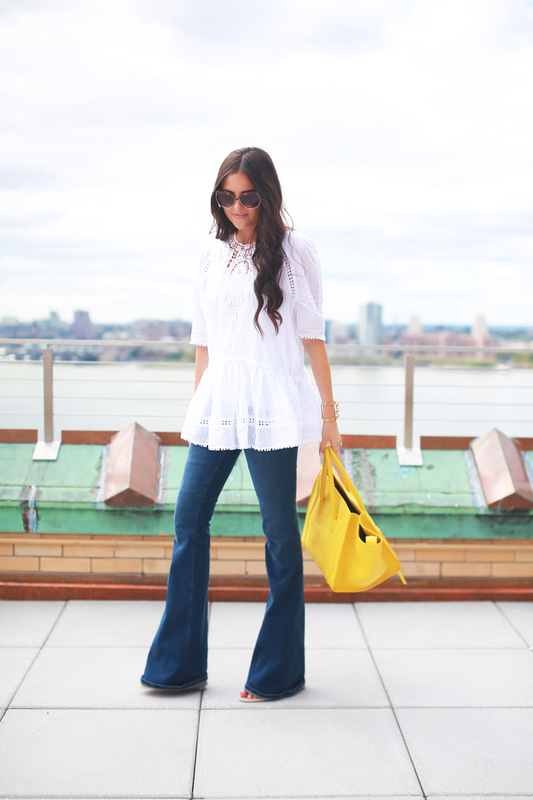 Wow, that bag is absolutely amazing, it looks so good with the lace and flares as well, I love it ! This blouse is so lovely! Wow this outfit is incredible! I think it’s one of my favorites that I’ve seen on you. Something about the white and yellow – that bag is more droolworthy to me than a Chanel! Fall Florals – Don’t Hang Up Your Flower Print Just Yet! This is one of my favorite outfits you have worn! It looks so cute and fresh on you! Beautiful top! And that yellow bag is stunning! love this outfit! too cute!! Love the flared top paired with the flared jeans! Great look! Love these flares! I’ve been really needing to get a pair of those! This is probably my favorite look on you! I LOVE everything!! This top is EVERYTHING! You look absolutely gorgeous! SO beautiful! You look so good in flares! Great look. I love that cuff bracelet but noticed you linked to an expensive watch instead. I’m confused. Can you please tell me where the bracelet is from? Thank you in advance. This is so pretty. I like the way you styled that yellow bag with that outfit. Beautiful lady with stunning post. I hope all is well! I’m working on press for a new luxury baby shoe company, Recess NYC. I would love the opportunity to send you a pair of shoes for your new baby Isla. Please let me know if you’d be interested. Looking forward to hearing from you! Love this look! So feminine and beatiful! Can you please tell me the name of these jeans by Frame? There are so many different flares and I need these! Thank you! !